Aisa Kabhi Nahi Hota Download Free PDF Books or read online Romantic Urdu Novels, Read "Aisa Kabhi Nahi Hota" and enjoy a short Urdu novel of Umera Ahmed, consists on 44 pages only. 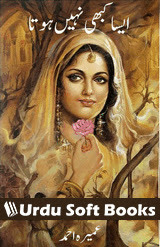 Aisa Kabhi Nahi Hota is an Urdu novel authored by a famous Urdu female novelist Ms. Umera Ahmed who is a well known and one of the most popular Urdu novelist in Pakistan. Download Free PDF Books or read online Romantic Urdu Novels, Read "Aisa Kabhi Nahi Hota" and enjoy a short Urdu novel of Umera Ahmed, consists on 44 pages only. Aisa Kabhi Nahi Hota is an Urdu novel authored by a famous Urdu female novelist Ms. Umera Ahmed who is a well known and one of the most popular Urdu novelist in Pakistan. She has written many Urdu Novels and scripts for blockbusters Urdu dramas in Pakistan. She has also won "Best Writer Award" in Lux Styles Award. Umera Ahmed is best known for her most selling novels such as Peer-e-Kamil, Main Ne Khwabon Ka Shajar Dekha, Zindagi Gulzar Hai etc. This Urdu Novel Aisa Kabhi Nahi Hota is also liked by many Urdu readers in Pakistan. This novel is short but very interesting and beautiful. You can download Urdu Books, PDF Books from each page of this blog using below download link.